St. Mary Catholic Church has been an historic cornerstone in Woodstock for well over a century. Fr. Bernard O’Hara became the church’s first resident pastor in 1855. During the 1870s, the church continued to grow as Crystal Lake and Barrington residents started to attend. In 1910, the present church building was dedicated. The Woodstock Historical Society has declared the church a historical site and provided a plaque for the parish. The church has grown steadily over the years and currently boasts a membership of more than 2,700 registered families. About 20 percent of members are Hispanic. The congregation is committed to local service work and supports mission projects designed to help neighbors in need. One way they do so is by supporting the St. Vincent De Paul Society, a group of churchgoers who serve the poor, sick, lonely and marginalized. Parish members donate food for the society’s soup pantry, held on the second Sunday of each month. The church also participates in a Christmas Giving Tree each holiday season. Church members shop for Christmas gifts for the needy and the week before Christmas, the gifts are delivered to those families. Fr. Burt Absalon leads Mass, which is celebrated Saturdays at 5 p.m. and Sundays at 7:30 a.m., 9 a.m., 10:30 a.m. and 5 p.m.
A Spanish-language Mass is celebrated Saturday at 6:30 p.m. and Sunday at noon. St. Mark’s Church has its roots in the log cabin of Geneva’s earliest settlers, but the parish didn’t become official until 1855, when services were held in the Kane County Courthouse. In 1868, the church built a chapel of its own and for the past 150 years, that stone structure has provided a space for worship. Church members are celebrating the milestone with several sesquicentennial events. The celebrations culminate with the 150th Celebration Weekend, scheduled for this coming April 27-29. Outreach is important to this church congregation, which provides numerous opportunities for services in ministry. Every summer, church youth partner with the Appalachia Service Project to engage in home repair and house rehab for impoverished residents around the rural Central Appalachian Mountain region. The congregation also donates time to Hesed House in Aurora, providing shelter for the homeless and emergency living quarters for adults and children. 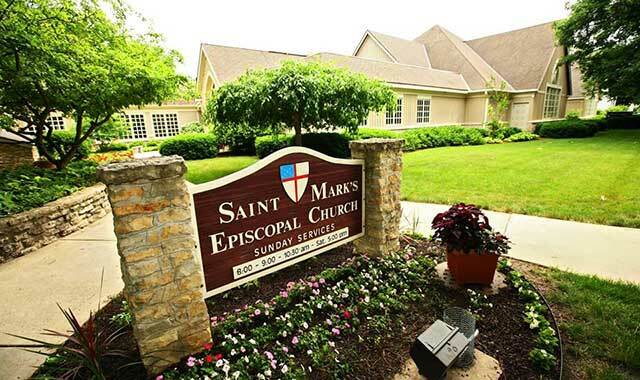 St. Mark’s churchgoers serve dinner, lunch and breakfast on the second Monday and Tuesday of each month. Rev. Mark Tusken leads services Saturday at 5 p.m. and Sunday at 8, 9 and 10:30 a.m. This entry was posted on Tuesday, January 9th, 2018 at 11:59 am	and is filed under Mind & Spirit. You can follow any responses to this entry through the RSS 2.0 feed. Both comments and pings are currently closed.